Obese and overweight patients have a lot to lose: their cartilage, their muscle tone, their quality of life, their limbs. 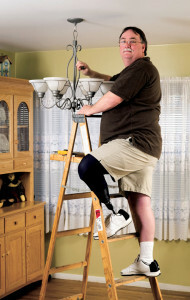 Few patient populations have more to gain from orthotic and prosthetic therapy. But no other group of patients poses a bigger clinical challenge. It’s no longer news that Americans are getting fatter; two-thirds of adults are now overweight, up from 45% in 1960. One-third are obese—defined as a body-mass index (BMI) ≥30—as are 17% of children.1 Such numbers tell only the beginning of the story, however, because all that extra weight affects overall health and has repercussions for orthopedic, orthotic, and prosthetic treatment of the lower extremities. A recent study found that obesity also increases the risk of overuse injuries such as tendinitis, plantar fasciitis, and osteoarthritis.3 This makes sense when you realize that every pound of body weight puts three pounds of force through the foot while walking, and seven pounds when running. One of that study’s authors, Carol Frey, MD, said that extra weight can even affect injury type. Frey, director of foot and ankle surgery and an assistant clinical professor at UCLA, as well as the fellowship director of the West Coast Sports Medicine Foundation in Manhattan Beach, CA, said the situation is more complicated than simple biomechanics, however. Even in nondiabetic people, obesity is associated with a metabolic syndrome that can slow the healing process—which means heavier patients might need to log considerably more time in an orthotic device than their lighter counterparts would before seeing a positive effect. “The syndrome has to do with fat percentage, because fat produces an estrogen-like hormone and also interferes with insulin production, which in turn affects healing,” she said. Such considerations affect the decisions practitioners make regarding treatment with O&P devices, as well as their outcomes. Robert Lin, CPO, said that children constitute roughly 60% of his practice, and that weight and diabetes status are often a factor. High-temperature polymers such as polypropylene remain Lin’s first choice of orthotic materials for obese patients. “Some people think you need to go with carbon fiber or metal and leather, but that’s not really true if you use the appropriate design, corrugations, and reinforcements with the polypropylene,” he said. One factor that can affect therapeutic decisions is plain old youthful metabolism. Obese children typically respond much more dramatically to weight-loss programs than older adults do, which offers both hope and challenges. If an overweight 14-year-old drops 40 pounds in six months, he may get healthier, but he may also need a new orthosis—or none at all. Lin sees differences in the type of injury suffered by adults and pediatric patients, as well. Ironically, such strains caused by obesity are often similar to the overuse syndromes common to adolescent athletes. Lin noted that many kids play sports year round now, so their bodies never get a chance to rest and heal. It may be better than obesity from the perspective of general health, but knee pain is knee pain, and clinicians have to address it whether it’s due to too much soccer or too many orders of fries. Lin believes that practitioners need to pay more attention to results. PCI is a simple way to assess walking efficiency. The patient walks, and the clinician measures the patient’s pulse over certain cadences, velocities, and distances. Then they repeats the exercise with the patient wearing the AFO. The coauthor of one of those studies, Douglas Dennis, MD, is president and executive director of the Rocky Mountain Musculoskeletal Research Laboratory in Denver and an adjunct professor in the Department of Biomedical Engineering at the University of Tennessee. In other cases, particularly with AFOs, some clinicians believe little or no adaptation is needed to make the orthosis suitable for the overweight. Richie, in private practice in Seal Beach, CA, is the inventor of the Richie Brace as well as an adjunct associate professor of applied biomechanics at the California School of Podiatric Medicine (CSPM) at Samuel Merritt College in Oakland. When a walking person puts three times their weight through their foot as they step, it’s called the ground reaction force, Richie explained. Such forces are important and related to pathology; however, torques on joints—or joint moments—are a bigger concern. As a result, Richie said, his fabricators don’t make significant adjustments for body weight unless a practitioner specifically asks for them. Others disagree in certain cases, however. According to Paul Scherer, DPM, distinct lower extremity pathologies require a range of flexibility in the orthoses or braces designed to address them, and patient weight is a consideration. Scherer, founder of ProLab Orthotics in Napa, CA, is also immediate past chair of the department of applied biomechanics at CSPM. “Flexibility is determined by the weight of the patient in relation to the thickness of the material,” he said. “When patients put weight on materials such as polypropylene, they become more flexible.” Scherer explained that a foot orthosis made of 3mm polypropylene would be rigid in a 120-pound female but extremely flexible in a 220-pound man. Active people of any age, overweight or not, typically become frustrated when an injury prevents them from working out, according to Lin. This leads to the kind of debilitating cycle described earlier, where disability leads to weight gain, which exacerbates the condition that caused the disability in the first place. Clinicians should pay close attention to the psychological aspect of such syndromes, according to M. Jason Highsmith, DPT, CP. Highsmith is an assistant professor of physical therapy and rehabilitation at the University of South Florida in Tampa. Highsmith notes, however, that studies show many highly active people aren’t that different in their daily habits than the sedentary, once you remove the factor of their workouts. This could help explain the bizarre phenomenon of people vying for parking places close to the front door of the gym, so they can walk as short a distance as possible before they go inside and get on the treadmill. Highsmith has found that prostheses for obese amputees need to be built of strong materials such as graphite and carbon fiber. To assess the appropriate choice for a given patient, he considers the potential for both “cycles to failure” and threshold of “ultimate failure.” The former describes how many times a device can sustain a lower peak load before it fails, whereas the latter refers to the maximum force it can take. Cycles to failure is often a concern in highly active patients, while ultimate failure pertains more to the obese. In either case, Highsmith added, patients who exceed the mass or activity levels recommended by manufacturers may require custom components. Nevertheless, prosthetists are much better at building components for heavy patients than they were a decade ago, according to Kevin Carroll, MS, CP, who is vice president of prosthetics for Hanger in Bethesda, MD. Prosthetists face an additional challenge because daily limb volume changes significantly in amputees, due to the loss of the skeletal muscle in the amputated extremity that would normally help regulate the pumping of fluid back toward the heart. Conditions such as obesity and cardiovascular disease compound the problem. “We have seen people with as much volume fluctuation as 20 plies of socks in a day,” Highsmith said. In other words, the residual limb may lose roughly 4 cm in circumference between morning and evening, and the amputee may need 20 layers of socks to maintain an adequate fit. In such cases, atmospheric suspension (suction) designs won’t work, and the practitioner must rely on pin or lanyard-strap models. It also means that if a patient loses weight, they may need a new socket sooner than their insurance will pay for it. In such cases, Highsmith said, prosthetists can make a new flexible interface for the existing socket, change the liner size, or employ other tricks to help the patient get through until reimbursement is available. At the end of the day, practitioners should become involved in helping patients manage weight, Frey said. Quality of life initiatives for obese patients are important, Richie added. 1. NIH. 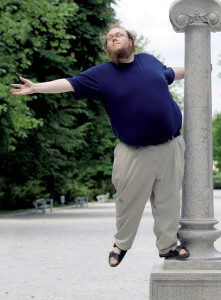 Statistics related to overweight and obesity, Accessed at: http://www.win.niddk.nih.gov/STATISTICS/. 3. Frey C, Zamora, J. The effects of obesity on orthopaedic foot and ankle pathology. Foot Ankle Int 2007;28(9):996–999. 4. Messier SP, Davies AB, Moore DT, et al. Severe obesity: effects on foot mechanics during walking. Foot Ankle Int 1994;15(1):29–34. 5. Irving DB, Cook JL, Young MA, Menz HB. Obesity and pronated foot type may increase the risk of chronic plantar heel pain: a matched case-control study. BMC Musculoskelet Disord 2007;8:41. 6. Riddle DL, Pulisic M, Pidcoe P, Johnson RE. Risk factors for plantar fasciitis: a matched case-control study. J Bone Joint Surg Am 2003;85(5):872-877. 7. Lake C, Trexler G, Barringer, W. Posterior tibial tendon dysfunction: a review of pain and activity levels of twenty-one patients. JPO 1999;11(1):2-5. 8. Mauch M, Grau S, Krauss I, et al. Foot morphology of normal, underweight, and overweight children. Int J Obes 2008;32(7):1068–1075. 9. Haboubi NH, Heelis M, Woodruff R, Al-Khawaja I. The effect of body weight and age on frequency of repairs in lower-limb prostheses. J Rehab Res Devel 2001;38(4):375–377. 10. Dennis DA, Komistek RD, Nadaud MC, Mahfouz M. Evaluation of off-loading braces for treatment of unicompartmental knee arthrosis. J Arthroplasty 2006;21(4 Suppl 1):2–8. 11. Komistek RD, Dennis DA, Northcut EJ, et al. An in vivo analysis of the effectiveness of the osteoarthritic knee brace during heel-strike of gait. J Arthroplasty 1999;14(6):738–742.